WEST MELBOURNE, Florida -- The Florida Highway Patrol is reporting that 91-year-old Joseph Williams of West Melbourne, Florida died as a result of injuries he sustained in a vehicle crash that occurred around 11:33 a.m. on Sunday in West Melbourne, Florida. 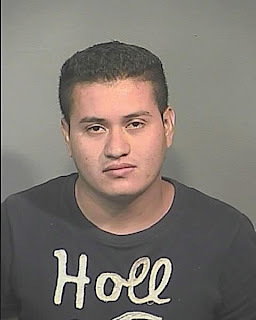 FHP says that 22-year-old Noe Mejia-Chacon of Palm Bay, Florida was driving a 2000 Dodge SUV westbound while 60-year-old Wayne Williams was driving a 1994 Plymouth 4-door eastbound on Eber Boulevard. Joseph Williams was a passenger in the Plymouth. According to FHP reports, Mejia-Chacon attempted to pass another vehicle that was traveling westbound over a double-yellow line. The SUV traveled into the eastbound lanes during the pass. The front of the SUV then struck the front of the Plymouth head-on. FHP says that Mejia-Chacon was involved in two other crashes prior to this crash. The first accident occurred in a Melbourne, Florida parking lot. The second crash occurred in Palm Bay, Florida. Joseph and Wayne Williams were both transported to Holmes Regional Medical Center in Melbourne, Florida. Wayne Williams suffered minor injuries while Mejia-Chacon suffered no injuries. FHP says that everyone involved in the West Melbourne crash were wearing their seat belts. Brevard County Jail records show that Mejia-Chacon was arrested and charged with DUI, DUI Traffic Offense and Damage To Property, Driving a Motor Vehicle Without A License, Hit and Run / Leaving the Scene of a Crash, DUI with One Prior, DUI Traffic Offense with Serious Bodily Injuries.